At Armstrong Watson we have been advising, supporting and protecting family businesses since 1867. We support family businesses through accountancy, tax and strategic business advice taking a holistic approach with your objectives at the heart of our bespoke advice. Whatever the size and structure of a family business the main objective remains similar, with a clear focus on providing a desired lifestyle for close family members. Each business is unique but the challenges they will face are not, which makes it highly important to get the right advice at the right time. When a family business disagrees, the tensions are not only felt in the business, but in the family environment as well, and become an issue you can not avoid. We can help to manage these scenarios when they arise, or provide proactive advice to limit the risk of them arising in the first place. An offer for your business is a reflection of your hard work and the success you have created and enjoyed. It is also a transition in your life which needs to be managed to ensure you protect your own family's future, and those of the team who have been an extended family throughout your ownership. Clear planning of how you pass the business to the next generation ensures you are investing the time needed to ensure this key transition is as smooth as it can possibly be. It also reduces the risk of any unexpected surprises which could threaten the reputation you have built. If you are the retiring generation you can probably recall your fears when you were passed the business. If you are the new generation you will be experiencing those fears. However, these fears are natural and can be overcome with the right advice and support. A family business is like any other business which needs to grow and succeed to survive. A clear strategy and defined goal can help to achieve the growth required to continue to trade but also to become the best you can be. We all spend a significant part of our working life striving to achieve our career or business goals, but when we get to the age when it is time to step back and retire are we ready? We need to do this from day one to ensure that when the day comes, we have adequate means to retire how we want to. All family businesses have a uniform requirement to comply with legal requirements for accounts, tax returns, VAT, Payroll, etc. Our history of supporting, advising and protecting family businesses of all size allows us to deal with you based on your circumstances and to give you the right solution for your business. Over the years we have seen everything that can go wrong but also everything that goes right in family businesses and the margins between the two can sometimes be very small. If a business is planning for the future and getting the right advice from the most appropriate professionals at the key times, the chances of success are much greater. At Armstrong Watson we don’t just support you with your compliance requirements, we want to understand your business, the challenges you face, and through our mutual partnership, ensure you grow to become the best you can be. The family business report identifies issues and opportunities faced by family businesses when looking to the future. It is one of the biggest surveys of its kind in the UK with a record number of respondents from all over the country, meaning the results have statistical significance and represent a good insight into the current state of play for family businesses in Britain. 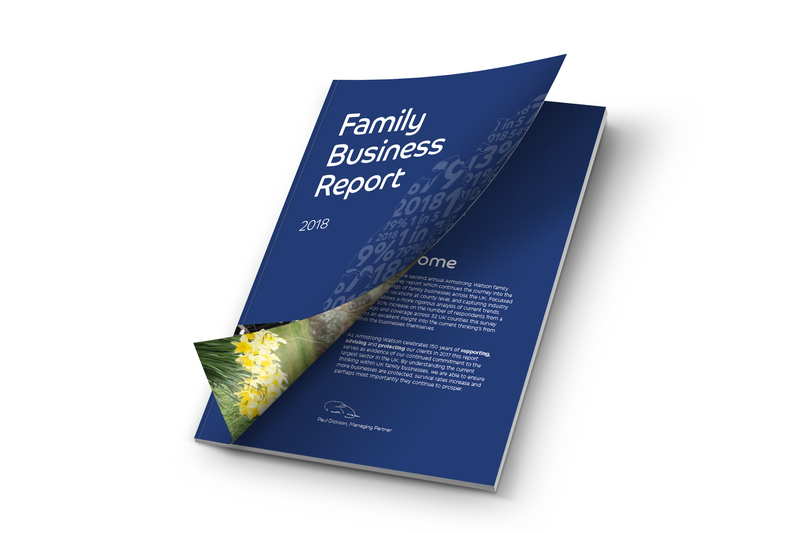 You can request your copy of the Family Business Report by clicking the following link.